This is a perfect summer treat, refreshing and beautifully light. You can serve it either as a dessert or as a palate cleanser between meals. Sorbet traces back its origins from the Chinese in the VII A.C. The Greeks thought it was a nectar of the Gods, the Romans loved it, and still in the 21th century we are enjoying it! Sorbet, also known in English as sherbet, is a frozen dessert prepared with sugar syrup flavored with any type of different fragrant fruit juices, fresh herbs (basil, mint for example), wine (champagne) and liqueur. The preparation is very easy and fast, the longer time is due to the freezing period. I would suggest to prepare it one day in advance and store it in the freezer. Sorbet should have a soft and smooth texture, so I add natural stabilizers to the recipe such carob seed flour and beaten egg white instead of chemicals and milk products like the mass production industry does. Carob seed flour is a natural thickening agent, rich with fibers, minerals and protein. Egg white is rich in protein too. They improve texture decreasing the freezing point. 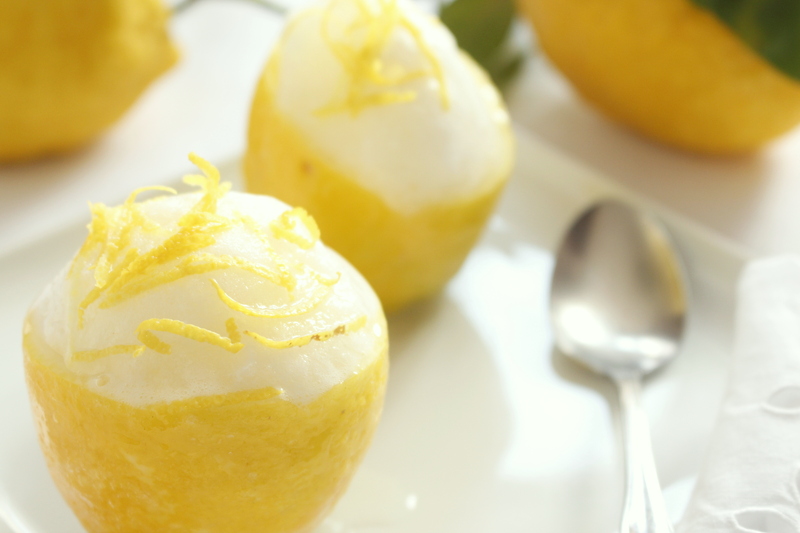 Lemon sorbet is my favorite flavor, delicate and digestive. I love it as a dessert because it is something sweet to enjoy but at the same time light. I don’t feel guilty after eating it! 1. Cool a steel bowl in the freezer for 30 min. 6. For the final step, you can choose from two different methods: ice cream maker or freezer method. Ice cream method: Pour the mixture into ice cream maker and follow the instructions. Freezer method: Pour the mixture in a suitable container and store in the freezer for one hour. Remove and mix with a fork. Put in the freezer for at least three hours. Remove from the freezer, stir and put back in the freezer for another three- four hours. At this point, the sorbet should be ready. To give the sorbet a creamier texture, pop it in a blender for just a few seconds and then fill the lemon shells and freeze again for about 20 minutes. Decorate with shredded lemon rind. You can also let it thaw a little bit and serve in a flute with a straw. A simple and Mediterranean recipe but definitely enjoyed all over the world. 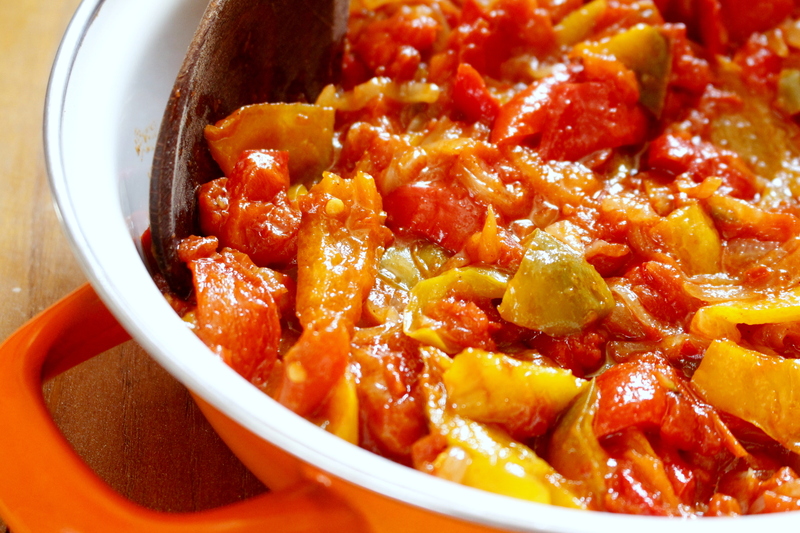 Peperonata (Pay-pay-row-NAH-ta) is a summer dish, since peppers are in season from June to September. Fruit and vegetables are definitely more tasty and full of flavor when they are in season. In summer I really like doing my vegetable shopping at the market, all stands are overflowing with bright colors and fresh fragrance. Peperonata is a simple dish made with bell peppers, onions, garlic and tomatoes, but it is very versatile; we can enjoy it as a side dish with meat (I love it with meatballs! ), with fish such as cod, as an appetizer with toasted bread, or as a first course on pasta. I leave the choice to you! 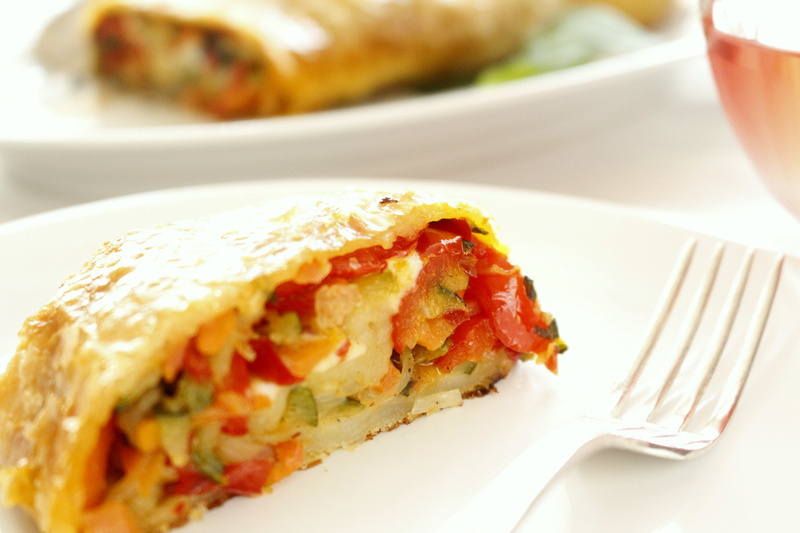 If you prefer a richer recipe, you can add some diced potatoes to the peppers. Instead, the Sicilian recipe adds toasted (in olive oil and garlic) bread crumbs before serving. Another delicious summer recipe to enjoy with these vegetables is grilled pepper, a tasty appetizer or a side dish. Do not forget that peppers are very rich in water, about 90%, therefore they are an excellence choice for your summer diet. 1. Peel the onions, wash and cut into thin slices. 2. In a pan heat the oil olive over medium heat, add onions and garlic. Sauté over medium-low heat for about 15 min. turning a few times with a wooden spoon until onion is soft and translucent. 3. Wash the peppers under running water. Remove the stalk, cut in half, then remove seeds and filaments. Cut the peppers into strips (1.5 cm, about 1/2 inch thick). Combine with the onion and garlic. Cook covered over medium-low for 15 min. Remove the lid, add the tomatoes, chilli pepper (optional), salt, pepper and sugar. Mix well and cook for about 15 min. until peppers are tender. Bruschetta (broo-SKAY-tah) is a perfect appetizer to serve with an aperitif; it’s fast and easy to prepare. The ingredients are simple: bread, tomatoes, olive oil (extra-virgin of course), basil and garlic, but the result is wonderfully flavorful. The type of bread that I use is homemade bread from Puglia or Tuscany. The quality of tomatoes is very important; they should be mature, sweet and full of flavor. They should also have a thin skin, because they should not be peeled. 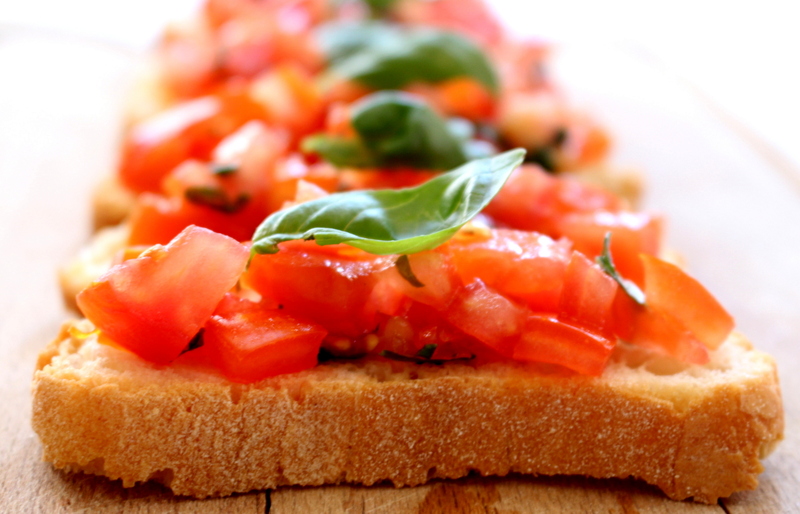 Bruschetta is a native of Rome, where “bruscare” means simply “to toast” in the Roman dialect. Originally a simpler version existed: only bread and olive oil. Today it is also a typical dish all over central Italy – Umbria , Tuscany and Abruzzo – and is prepared using tomato, too. I personally prefer this version; I find it more tasty and inviting, perfect for a summer cook out.